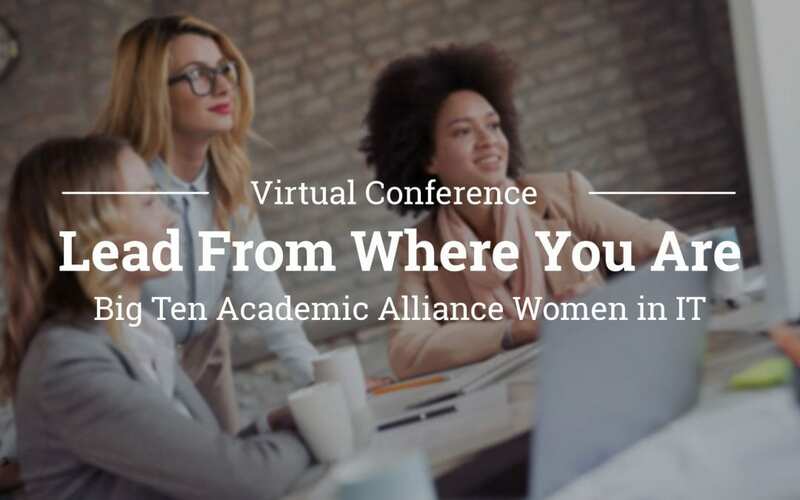 The first virtual conference Lead From Where You Are, sponsored by the Big Ten Academic Alliance Women in IT (WIT) peer group, was held on February 8, 2019. The three-hour webinar featured two women keynote speakers and a panel of three women at different stages of their IT careers, sharing advice on the importance of diversity as well as building an inclusive culture in the workplace and in higher education. At Penn State University Park campus, women and men in IT attended the webinar at two watch party locations at the Technology Support Building and The Dreamery at the Shields Building. A total of 28 watch party locations were organized across the Big Ten with an additional 331 Zoom virtual attendees joining in on the discussion. Keynote speaker Ana Hunsinger, vice president of community engagement at Internet2, kicked off the webinar with alarming statistics on the number of women in technical professions and the rates of attrition for technical women. She cited that in 2015, women made up only 25 percent of computing-related occupations and the number has continued to decline, despite the increase in the percentage of women in select STEM undergraduate degrees. The statistics are even more concerning when it comes to women of color where only four percent of Black and Hispanic females hold U.S. computing jobs. The rate of attrition for technical women is 56 percent leaving their organizations at the mid-level point (10-20 years) in their careers. The takeaway from Hunsinger’s discussion is how leadership in organizations need to recognize the problem in order to make a commitment in changing the work environment, allowing for increased creativity and job satisfaction by championing women in technical professions and encouraging male counterparts to advocate for more women to rise to leadership roles. Hunsinger is proud that Internet2 believes that diversity is essential for research and education. Through the Internet2 Inclusivity Initiative (I2I), her organization focuses resources, attention, and scholarships to improve gender diversity and inclusion in the community of networking and technical professions. Second keynote speaker Maureen Biggers, director of Indiana University’s Center of Excellence for Women in Technology followed up with a talk on how we all have unconscious biases and make associations about characteristics such as race and gender, but research shows that gender-diverse teams demonstrate superior productivity and financial performance compared with homogenous teams. In a study of 500 U.S. businesses done by the National Center for Women in Technology (NCWIT) on the Impact of Gender Diversity on Technology Business Performance, companies with more race and gender diverse teams had higher sales revenue, more customers, greater market share, and greater profits than did less diverse companies. Biggers explains that we need to be aware and intentionally put your own biases aside when hiring or promoting people within an organization.The three career panelists Diane Dagefoerde at Ohio State, Kaylah Norris at Rutgers, and Laura Farvour at University of Minnesota, all shared their tips for career success, adding in their own personal experience with challenges they faced as women in the technical profession. The underlying message the panelist focused on was how important it is to empower other women to make those career leaps forward, to believe in your ability to succeed, and to never be afraid to take risks.